It was so sunny and bright and warm this afternoon that I spent a lot of time wandering my neighbourhood. It was a welcome relief from being chained to the computer working on client projects. The sun was strong and it smelled like springtime — a welcome relief from the cloudy drizzle that the Pacific Northwest is known for. I went to the little Italian market in my neighbourhood and picked up some beautiful looking vegetables that could, by their very presence, transform my kitchen into a bit of early spring. With this recipe, any vegetable combination would work well. Use what’s in your kitchen and I’m sure you’ll be fine. 1. Cook pasta as per box directions. Drain and set aside. 2. While pasta is cooking, preheat oven to 400 degrees. Chop onion into large chunks and roughly chop the garlic. Cut zucchini into 1/2″ slices. Cut mushrooms into quarters and chop up the peppers into large pieces. 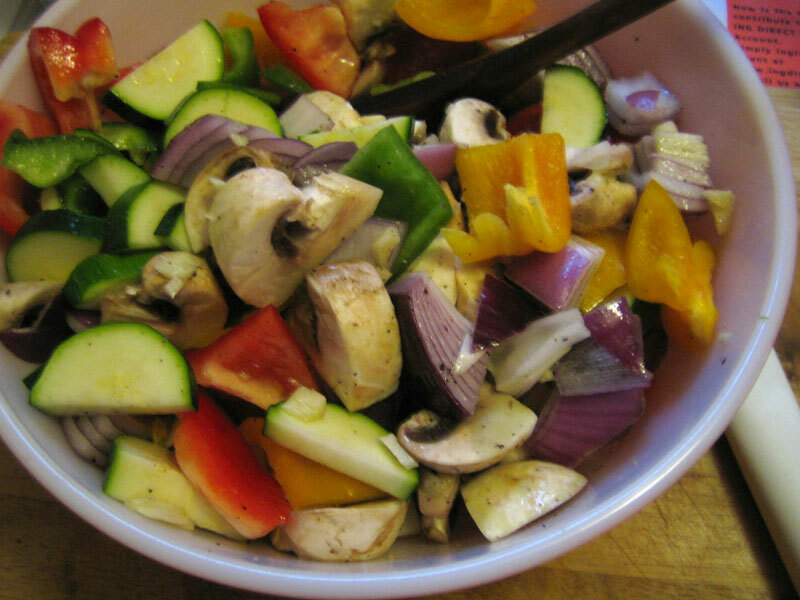 In a large bowl, toss the vegetables with 2 T of olive oil, some salt & pepper and 1/2 of the basil. Dump the vegetable mixture into a large baking dish and roast until vegetables are somewhat soft, about 20 minutes. 3. Add the cooked pasta into a large bowl and toss with the capers, lemon zest, roasted vegetables, kale, feta cheese and the grated mozzerella. Add a bit more salt & pepper and throw in the rest of the basil. Pour out into a large baking dish. 4. For the topping, combine the bread and parmesan cheese with the reminder of the olive oil and spread over the pasta mixture. Bake uncovered for 400 degrees until golden, about 30 – 40 minutes. i need a special lap top in my kitchen tuned into your blog so i can make all the recipes right then and there. mmm… sounds good. I will have to try this one. This isn’t directly relateable to this post (though the veggies look awesome) but wanted you to know that the baked oatmeal recipe made a mildly sick and grumpy 3 year old quite happy this morning 🙂 This will *definitely* be in the MamaArsenalofSickFood…thank you! I love any kind of pasta dish, but this one in particular sounds incredible. Thanks for sharing the recipe! Jana, I’m not a huge fan of zucchini, but this was so tasty! Even Cornelius who HATES the zuchs, loved it. Oh, thanks Heather, glad the recipe could do more than just make me smile! Thanks Michelle, it was so tasty and I don’t mind eating the leftovers one bit! Ivonne, thanks. It was pretty simple to put together & the results were worth it.